Obama’s three-point plan for deficit reduction can be summed up in three words, “Spend Baby Spend.” In fact, Obama will have borrowed more than $6.3 trillion during his four-year term, which is more than the first 42 and 1/4 presidents combined. And what do we have to show for it? Nothing! The only thing that his profligate spending has accomplished is to effectively stifle any chance of recovery from the December 2007 recession. To answer this, all one has to do is look at employment. The number of jobs reached an all-time high of 138,023,000 in January of 2008, but today, we are still 5.3 million jobs short of this mark. As of the February 2012 Employment Situation Report, employers logged in a total of 132,697,000 jobs. Well great, but that’s only 170,000 more jobs than there were in February of 2001. In fact over the same 11-year period, the civilian non-institutional population grew by 29,692,000 persons. So since the working age population has grown by over 29 million, while the number of jobs has grown by a mere 170,000, the answer to that question is negative. The handwriting is on the wall. So what was Obama’s three-point deficit plan, again? Step one was to borrow, step two to spend, and step three to repeat step one. As you may recall, “We have to spend more to keep from going broke.” It’s Endless Stimulus! Spend baby spend! As far as when principal repayments will begin, well, even with a second term, that would be never, since Obama failed to produce a budget during his first term. As we discussed in War on Wealth III | National Debt Review, since the gross public debt as a percentage of GDP has skyrocketed from 69.9% in 2008, to 104.8% in 2012, and is projected to reach 107.8% by 2014, our ability to repeat the mistakes of the Obama administration is over. This means there won’t be a second term. The Era of Obamanomics is over. Obama prematurely increased spending to DEFCON 1 levels, yet World War III isn’t here yet. 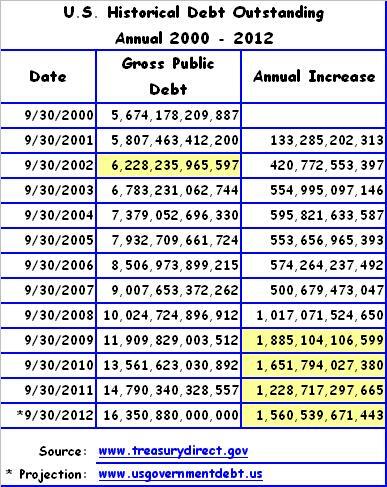 And in spite of this undue debt, we are now heading directly into another recession, this year, in 2012. The Economic Cycle Research Institute (ECRI) reiterated its recession call on March 15, 2012, in a detailed report entitled, Why Our Recession Call Stands. Honey baby, when the federal government borrows and spends $6.3 trillion dollars, as it has done between fiscal years 2009 and 2012, that’s 6.3 trillion fewer dollars the private sector has had access to. Having trouble qualifying for a loan? Did your local bank go belly up while you waited for approval? Small wonder; for even lenders are rational beings. Shall we lend more money to homeowner’s who are already upside down on their mortgages, to small businesses owners who lack guarantees, or shall we instead lend to the federal government which has a guaranteed ability to repay? A printing press, that is. 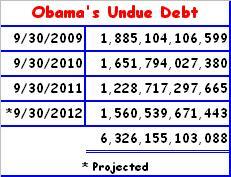 Undue Debt is the biggest factor contributing to the Malaise of 2012.